The Skinny: A typical Hong Kong police film that's notable thanks to incredible action sequences and the presence of action goddess Michelle Yeoh. Eighties Hong Kong action classic featuring a young Michelle Yeoh before her first retirement. 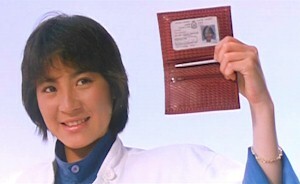 Yeoh is a Hong Kong policewoman who joins forces with security officer Michael Wong and Japanese cop Henry Sanada to foil a hijacking. Made heroes, they become targets for some brutal war veterans out for revenge. Then fighting occurs. This is typical eighties HK Cinema, which means the music, subplots, and dialogue are cheesy as all hell. When Sanada meets up with his family, it's sap city. Likewise, Michael Wong is overly annoying as the earnest security officer who's the "gee whiz" member of the gang. Get used to overdone histrionics, too. Subtlety, thy name is not Royal Warriors.